WeddingWire Couples’ Choice Awards® recipients represent the top five percent of wedding professionals on WeddingWire who demonstrate excellence in quality, service, responsiveness, and professionalism. Lifestyle Limousines is honored to have been chosen as the Best Wedding Limo Service in Raleigh the past several years, and plan to continue exceeding your expectations for years to come! As a bride or groom, you can imagine every amazing moment of your wedding day. We want you to have the confidence that your journey to the ceremony, reception, and beyond is stress free, elegant, and comfortable. Lifestyle Limousine wants to ensure you arrive in style, with the picture-perfect entrance you’ve always dreamed of! When it comes to your wedding, you want to work with experienced & trustworthy companies who have a track record for success! Lifestyle Limousine has been providing exceptional wedding services in the greater Raleigh area since 2014. We love working with our brides and their event planners (we have worked with most of the planners in the Triangle area) to make sure everything is on time and runs perfectly from pickup to the red carpet arrival. We own our vehicles and know that they and our expert chauffeurs will help you begin your marriage adventure without worrying about logistics! All parties who used Lifestyle Limousine for their wedding and bachelor/bachelorette parties will receive 10% off their total fee! Lifestyle Limousine Company is honoured to have received back-to-back awards as the top rated Wedding Limo Service in Raleigh area on Wedding Wire in 2017 AND 2018. Not only do we specialize in Limousines but we do more than 100 weddings every year! We offer several wedding packages to try and accommodate the needs of all of our wedding couples. In addition, we offer one of the largest fleets in the area. With our extensive fleet of vehicles we will work with you to find the vehicle that suits your needs. We offer meticulously maintained 9 – 26 passenger limousines. We do not just book wedding transportation, we help create reliable elegant experiences for you and your wedding party. We also have Shuttle Vans and Luxury Sedans with friendly, professional service if additional transportation needs arise. Our professional chauffeurs undergo a full background check and drug testing with a DOT Exam every year. They always arrive in professional attire – wearing a black suit, white shirt & tie. When you call us, you will speak to one of our in-house service consultants. We own all of our cars. We strive to uphold the highest professional standards for each and every client. 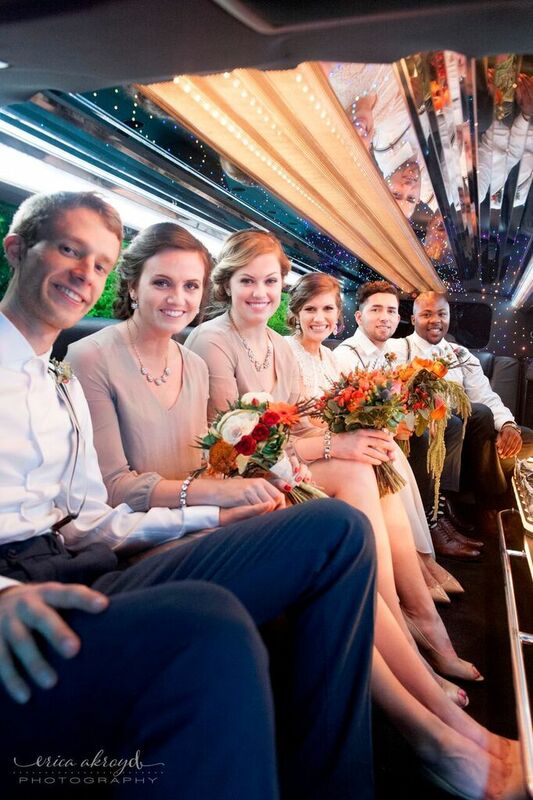 If you’re looking for a wedding limousine in Raleigh, Cary, Durham, Morrisville, Chapel Hill, Wake Forest, Garner or beyond, we want to be your transportation service of choice! Call us today to learn more about our wedding limo packages! Hands down the best service out of every vendor we used. This was for my sister’s wedding, but I was in charge of handling the transportation of the bridal party. Everyone was so nice and helpful! They called to confirm everything multiple times, made a few pit stops for the guys on the way to the venue, and on time for everything. They weren’t the type of people that marked up prices and worked with me for a while on making sure I could get my sister what she wanted and stay in budget. They are the best limo service in Raleigh – Trust me!